What's new in the T-SQL language in SQL Server 2017? Not much! I've listed the new functions under separate headings below. At last: the TRIM function! There is one new function in SQL Server 2017 which is way, way overdue - TRIM! At long, long last - if you want to strip trailing and leading blanks from a string of text, you no longer have to combine RTRIM and LTRIM. SQL Server enters the 21st century! The function even supports Intellisense when choosing the column name whose values you want to combine. 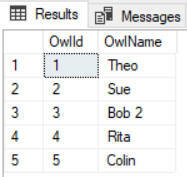 This table contains the names of 5 owls. The result of running the above query. You used to be able to do this by messing about with XML file paths - I for one won't miss this fudge! The null values are ignored. The query makes 3 replacements, as shown below. The query replaces ( with [, ) with ] and x with X, avoiding the need to use a series of REPLACE functions. The fact that the search string and replacement string have to be the same length makes this function of limited use.